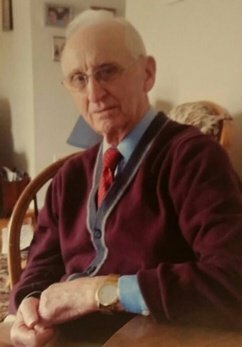 Walton O’Roak, 96, of Island Falls died February 3, 2019, at Maine Veteran’s Home in Bangor after a courageous battle with Alzheimer’s disease. He was born March 11, 1922 in Sherman Mills, Maine, the son of Burleigh and Mattie O’Roak. Walt was a beloved husband, father, grandfather, great grandfather and great-great grandfather. He will be sadly missed by all who knew him. Walt was truly a member of the greatest generation. 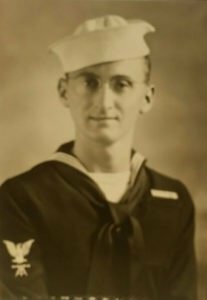 In 1942, during his second year at Ricker College in Houlton, Walt left school to join the Navy. He proudly served on the USS Baltimore until the conclusion of World War II. The Baltimore and Walt saw action throughout the South Pacific. Walt often referred to his time of service as “the best time of his life” and would proudly tell of providing transport to President Franklin Roosevelt to Pearl Harbor for a historic conference. When he returned home to Sherman, he signed up for the Naval Reserves and was called back to service during the Korean War for an additional year of service to his country. In 1947, Walt courted and married the love of his life, Gwendolyn Whitehouse. They settled in Island Falls and together they raised four children Jon, Jill, Joleen, and Jeff. Walt pursued many careers to support his growing family but was best known for his restaurant and as a rural postal carrier. He was an active member of his community serving in many capacities as selectman, school board member, Summerfest organizer, the Masons, Knights of Columbus and most especially as a proud veteran and member of the VFW. He was known as “Mr. VFW” for his many efforts on behalf of all veterans. Walt had many loves. He loved the outdoors, especially hunting and fishing with his sons. Most memorable were trips to Allagash Lake and the “hunting camp”. Although it was clear that these were wonderful times, the details were suspiciously absent. He loved making donut runs with Gwen at 2:00 in the morning. He loved his children but he was an especially loving and doting grandfather, great grandfather and great-great grandfather. Walt is survived by his wife of 71 years, Gwendolyn, his son, Jon and his wife Susan, his daughter, Jill and her husband Wilbur, his daughter, Joleen and her husband Bob and his son, Jeffrey and his partner, Lori. Walt has six grandchildren, Jaime Hersey, Janice Rushton and husband Jerrod, Rob Porter and wife Bev, Erin Bird and husband Michael, Shannon O’Roak and Maureen O’Roak. Walt has seven great grandchildren, Bryce Porter, Lauren Porter and partner, Dylan, Jayden Rushton, Jordyn Rushton, Liam Bird, Quinn Bird, Keegan Bird and one great-great grandchild, Luca Crawford. He is also survived by his sister-in-law, Cheryl Rivard and her husband Norm, many nieces and nephews, friends and colleagues. He was predeceased by his parents and brothers and sisters Frederick, Verda, Bill, Pud, Corinne, Dot and Dean. The family would like to extend heartfelt thanks to the staff at Maine Veteran’s Home in Bangor for their kind and dedicated care of Walt during his stay. We have grown especially close to and are grateful to the Angels of Unit B. Funeral services will be held at the St. Agnes Catholic Church in Island Falls on February 8 ,2019. Visiting hours will be at the church from 10-11 am, followed immediately by a Requiem Mass. There will be a time of fellowship at the VFW Hall in Island Falls immediately following the service. A military service will be held graveside in the spring. In lieu of flowers, donations may be made to Local VFW Post 7529, Island Falls, Maine 04747 or Maine Veteran’s Home Unit B, 44 Hogan Road, Bangor, Maine 04401. Walt was born on March 11, 1922, in Sherman Mills, Maine. Raised on a farm, he attended a one-room schoolhouse, and later graduated from Sherman High School. In 1940, he enrolled at Ricker College, but following America’s entry into WWII, he left Ricker to enlist in the U.S. Navy. With the completion of basic training, Walt joined the crew of the U.S.S. Baltimore at Newport, Rhode Island, in April 1943. After traveling to her home base of Pearl Harbor, the Baltimore, a heavy cruiser, set out to make its contribution to the war in the Pacific. The ship and her crew provided fire support for many of the most intense and well-known military operations in the South Pacific. From November 1943 to June 1944, the Baltimore supported actions at the Makin Islands, Kwajalein, Truk, the Marianas, Hollandia, Wake Island, Saipan, and the Battle of the Philippine Sea. “It seemed like we were all over the South Pacific,” Walt, who served as a fire controlman-first class, remembers. “We saw a lot, alright. There was so much shooting, so much firing. The Baltimore got hit, but we were lucky, we had very few casualties.” In July 1944, the Baltimore returned to the U.S. where she had the honor of transporting President Franklin Roosevelt to Pearl Harbor for his historic conference with Admiral Nimitz and General McArthur. The incident made a big impression on young Walt, who enjoys telling of the pride he and his crewmates felt at having the President of the United States as a passenger on their ship. The Baltimore, however, was not through with combat. It would go on to participate in the actions at Luzon, Formosa, Okinawa, Honshu Island, and Iwo Jima. Walt believes that serving his country and being a crewmember of the U.S.S. Baltimore are among the best things that happened in his life. “She was an excellent ship with a top crew,” he said with great pride. For its outstanding service, the Baltimore was awarded the Asiatic-Pacific Campaign Medal with Nine Battle Stars. Following the Japanese surrender, Walt was discharged and returned home to Sherman Mills. 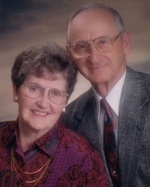 In 1947, he married Gwendolyn Whitehouse and after moving several times, they settled in Island Falls, Maine. It was there that they raised their four children— Jon, Jill, Joleen, and Jeff. Still under reserve status, Walt was called back into the Navy during the Korean War. He served in Cuba for a little more than year before returning to his family in Island Falls. Walt worked at numerous jobs (sometimes two at a time) to support his family. They included; fuel oil delivery man, construction worker, bookkeeper, and farm boss. In 1963, he opened his own restaurant in Island Falls, which he operated until 1970. A few years later he started a new career as a postal carrier. Even with the demands of supporting a large family, Walt consistently made time to give back to his community. He was devoted member of the local VFW Post where he became known as “Mr. VFW.” Walt was committed to honoring all veterans, and he was the person who envisioned and spearheaded the building of a permanent Vietnam War memorial in Island Falls—one of the first such memorials in that part of the state. Walt also served as a town selectman, a Mason, and a member of the local Knights of Columbus. Thank you, Walt, for your service to our nation! Maine Veterans’ Homes is an independent nonprofit organization serving Maine’s veterans and families. For more information, contact Maine Veterans’ Homes online or give us a call at 800-278-9494. We also welcome you and your family to explore employment or volunteer opportunities with us.